This product includes these features: Ultra-Clear Window Material Framed With Heavy-Duty ProtekX6. F.. The Stellex Trailerable Boat Cover by Classic Accessories provides superior protection regardless of.. The Roanoke Pontoon Boat by Classic Accessories is rugged, nimble and reliable. Lightweight and easy.. The Terry Cloth Golf Seat Saver by Classic Accessories extends the life of your golf car seat by pro.. The Fairway Golf Collection by Classic Accessories is our most innovative and sophisticated program ..
Classic Accessories Diamond Air Mesh Seat Covers (Navy), protects new seats or renews the look of ol..
Classic Accessories Diamond Air Mesh Seat Covers (Black), protects new seats or renews the look of o..
Easy to attach cover protects hitch from dirt, weather and debris.Features of Classic Accessories 80..
Protection In Any Climate or Season Weather and defilement ProtectionHeavy-duty, triple-ply P.. The ATV Storage Cover by Classic Accessories, uses durable ProtekX2 fabric with water-resistant back.. The QuadGear UTV Front Windshield by Classic Accessories instantly shields against wind and rain. Ul.. The QuadGear UTV Cab Enclosures by Classic Accessories provides heavy-duty protection in all weather.. The QuadGear UTV / Side by Side Bench Seat Cover by Classic Accessories provides a quick-fit cover t..
An RV is one of the most expensive purchases you can make outside of your home. So protecting that a.. 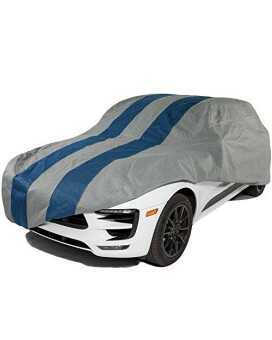 Durable all-weather protection and storage for your car. Duck Covers Rally X Defender semi-custom co..